Due to increase in demand and consumer awareness, organic products are priced anywhere between 20% and 75 % higher than the conventional ones. The Indian market for organic products is expected to cross the ₹10,000 crore mark by 2020 and is rapidly growing at 40-50 per cent! The global demand for organic products is growing at 20-25 per cent per annum. Over 90 per cent of the net sown area in India faces a severe Summer with temperatures exceeding 40 degrees Celcius. This is also a time of pest attacks like mites and other flying insects. Farmers rely wholly on disease and temperature resistant varieties during this season for healthy crop growth. To liberate agriculture from the clutches of climate change and to improve yield by utilising biotechnology, farmers have adopted the use of high-yielding Hybrid seeds from well known companies. Farmguru brings the best of these seeds to the market with the convenience of ordering from the mobile phone and getting delivery at their doorsteps. India is the second largest producer of Vegetables in the world and it is the most important source of nutrients for the population of India. 2.8% of the total cropped area of the country is under Vegetable production. The plant protection measures for the main pests and diseases of vegetables require careful monitoring. Modern farming practices are essential in order to prevent diseases while growing vegetables presenting one of the greatest challenges to vegetable growers. Farmguru uses its expertise to put together a list of the best products for vegetable growers. Approximately 7,000 plant species are estimated to be used for human consumption. Many of these crops are grown in India, which has the potential to become a major producer of biotech vegetables. It is estimated that by 2050, India’s population will exceed 1.6 billion, up from 1.3 billion in 2016. This means farmers will need to produce 40 per cent more food on less land than ever before. Across the globe, this increased demand for food, together with demand from competing uses, has been placing unprecedented pressure on many agricultural production systems. Over 55 per cent of the net sown area in India lacks irrigation facilities and hence, farmers rely wholly on rain water for crop growth. The need of the hour is to liberate agriculture from the clutches of climate change and to utilise biotechnology to meet the growing food needs. India’s food security depends on producing more fruits and vegetables to meet the demands of a growing population with rising incomes. To achieve this, farmers have adopted the use of high-yielding Hybrid seeds from well known companies. 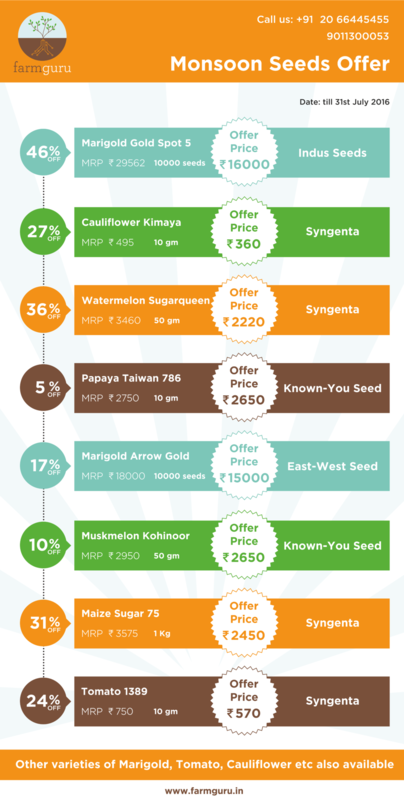 Farmguru brings the best of these seeds to the market with the convenience of ordering from the mobile phone and getting delivery at their doorsteps.